Tinctures are steeped in tradition and were an important component of Hanna's work. 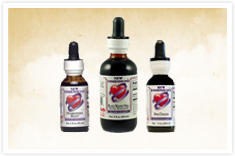 Tinctures release special properties for a potent and effective way to use herbs. These quality tinctures are crafted at a 1:5 extraction, which means that there are 6 grams of herbs for every 30 milliliters (1 oz.) bottle of liquid.